If the new UMNO leadership had nothing to hide would they be lashing out in the Gestapo fashion, witnessed by astonished Malaysians over the past few days? And if the documents published by Sarawak Report were false or ‘doctored’, why have these desperadoes been ordering the ransacking of public offices and the arrest and interrogation of all the public investigators who have been looking into 1MDB on the grounds of “criminal leakages”? To the contrary, were Najib secure in the knowledge of his own innocence he and his remaining henchmen would be relaxed and aloof. They would take a superior position, while of course issuing a vicious libel action through their lawyers to destroy and ruin the writer of Sarawak Report. Far from it, they are instead acting like desperate men determined to hide, bully and crush the truth by instilling fear of aggressive action against anyone who so much as mentions the issue that is exposing them so dangerously. Look how the Triumvirate have come out gnashing their teeth and brandishing their fists over the past few hours. Zahid Hamidi, the new key linchpin in the Najib regime, as Home Minister and Deputy Prime Minister rolled into one, has plunged into the role of bully boy and human rights abuser like a mad barking dog, ordering arrests and destroying in an instant the expensively crafted PR image of Najib in the West. 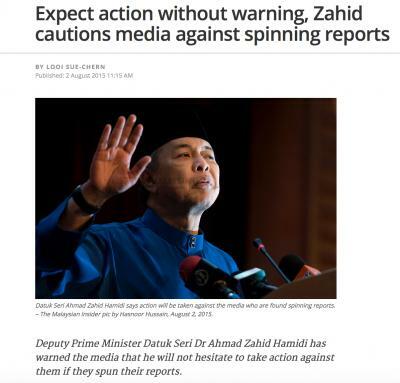 Calling himself an “Islamic fundamentalist” Zahid yesterday threatened the media that they should “expect no warning” of him “taking action” if he found them “spinning”. By this Malaysia was left in no doubt that he was warning the press to halt any mention of the scandal surrounding 1MDB, which has embroiled his boss. The world now realises that there is no real freedom of the press in Malaysia or genuine rule of law. And while the world is looking on (slack jawed) perhaps we should recall some other recent revealing remarks by this bunch? For example when Najib Razak rallied his party faithful earlier this year by telling them they should “act more like ISIL fighters” and be solidly obedient to him. 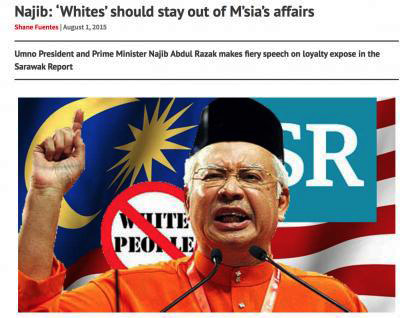 Yesterday Najib repeated that sentiment, whilst also condemning what he called interference by “white foreigners” (meaning journalists). Najib proceeded to then openly announce to his fellow Malaysians that he values loyalty to him over ability in those he appoints to government office. All this is as revealing as it is brutal and vile. Why has the man who has so long attempted to act the suave modern reformer suddenly started lashing out like a thug? 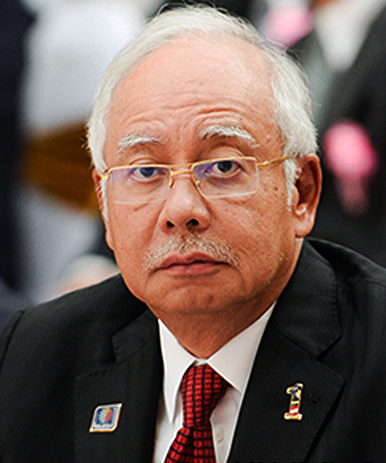 Mr Najib Razak, it is our human right to report and you have just publicly acknowledged that you have been “exposed.” By those “problems” you mean plainly mean corruption. 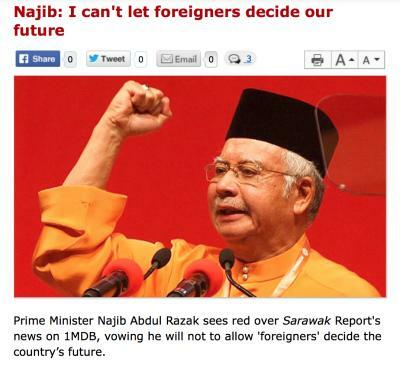 So what is the rest of the world to think and what are Malaysians to do with such an embarrassment for a leader? 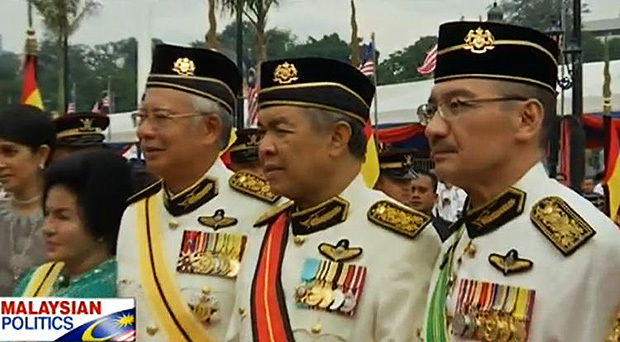 Of course, the third member of the new ruling Triumvirate (the rest of the cabinet have been deafeningly silent the past few days) is the army minister, Najib’s cousin Hishamuddin Hussein. Hate against the West the way forward for Malaysia? This puts every lever of raw power in the hands of Najib, his deputy and his own cousin (overlooked by the unofficial “Big Boss”, Rosmah Mansor) for as long as he retains his UMNO party base. UMNO has long adopted the same strategies as the old Soviet communist party and similar dictatorships, by assuming almost totalitarian control of Malaysia and its civil institutions – as everyone well knows. But, is this latest brutal clamp down on all critics of the country’s now crippling corruption issues what UMNO and Malaysia really want? With an already plummeting economy, not least because the cracks and BN’s false figures are now becoming ever more apparent to outsiders, Malaysia faces a very grim prospect if this Najib coup d’etat succeeds in bringing the country under his total, foreigner-hating dictatorship. Malaysia, which was until so recently regarded as a possible ‘Asian Tiger’, rising into the category of leading, modern open economies like South Korea, Taiwan, Japan and Singapore, will surely descend into the category of an ‘Asian basket-case’ – along with Burma, Vietnam and Cambodia. It is those former South East Asian dictatorships, which have subsequently found their liberty, that are now being talked up by the world economists, including Indonesia and the Philippines, who were once thought of as servants by Malaysians. If the Rosmah/Najib dictatorship slips now into full throttle – a corrupted establishment with a muzzled media and obedient civil service and judiciary – might Malaysians become the ones forced to send their daughters to earn money in better off countries, while the rest of the world ceases business with such a set up? What a shame for Malaysia if such were to come to pass, but it appears to be the price that Najib is willing to exact, so that he can continue in power and remain protected from the consequences of his actions at 1MDB. It is not at all in the capacity of Sarawak Report, a mere blog, to determine such events, as Najib is ridiculously attempting to bluff his audiences. But, it is certainly our right and capacity to report on them.